Dave's Hopper is a pattern designed by Dave Whitlock during the mid-1950's. Dave tried to incorporate aspects of both the Muddler Minnow and Joe's Hopper, which was the popular hopper pattern of the early 1950's. He tried to give the hopper a low wind resistance with the ability to make a "splat noise" when striking the water. The hopper also needed to float low within the surface film with a strong body and leg profile when viewed from below. 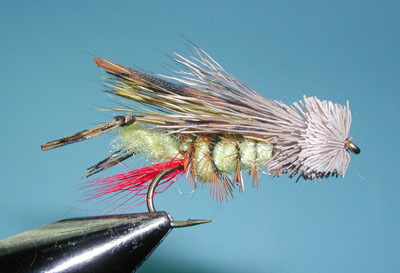 The hopper pattern is probably one of the most popular to tie. Color variations can be used to create crickets (all black) or stonefly imitations. 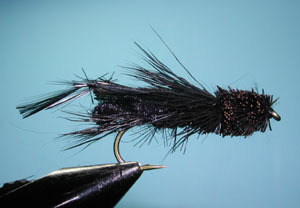 The original Dave's Hopper called for legs made of knotted Yellow-dyed Grizzly hackle that were trimmed. Later, many tiers made the legs using knotted pheasant tail fibers. His original pattern also called for a wool body which sinks better than synthetic materials. Dave's Hopper is also more streamlined than many hopper patterns and can be easier to cast within gusty conditions. 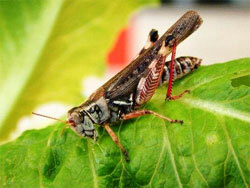 In the Sierra's, Dave's Hopper is primarily used in late summer from August through October. Hoppers prefer warm days above 70 degrees. The best time to fish these flies are during the late morning to mid afternoon, particularly when wind gusts are present which knock the naturals into the water. Once knocked into the water, most hoppers try to kick back to shore and many trout await in anticipation of a big meal. Try to cast the hopper pattern around large boulders and next to undercut banks. Look for banks with plenty of grass and areas with downed trees or brush around the streambank. Dave prefers to fish his hopper patterns with a 6 weight bass-bug-taper fly line that was designed for smallmouth bass. The line gives him the best opportunity for accurate casts under windy conditions. Dave also likes to use a Duncan Loop to attach the hopper to the line and adds some floatant on top of the head, collar, and wing. Weighted hoppers can also be used or unweighted one with splitshot or twist-ons about 18" above the hopper. This will allow the hopper to go subsurface and drift under logs and banks. There are three good presentation techniques that Dave Whitlock prefers. One, the Upstream Bank Cast, make 25 foot sidearm casts upstream next to the bank and then some casts 2-3 feet from the bank. Try not to shorten the casts as to scare the trout. Two, a Downstream Bank Clap, bring the hopper hard against the water, pause for 3 seconds and twitch the fly towards shore. Move downstream to the next likely spot and repeat. Three, Across and Downstream, a 30-40 foot cast putting the hopper 3, 5, 10, and 15 feet from the bank. Allow the hopper to dead drift or twitch it. Do not wade close to the banks you are fishing.